From a pastoral hillside dairy that would take your breath away, come handmade artisan cheeses. From the fertile fields of Northern California orchards that are hundreds of years old, come the ripe pears, sweet apples and fragrant oranges. And the rest? 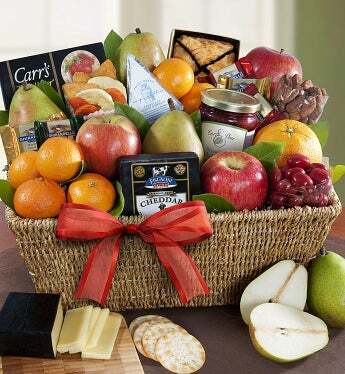 Well, the Strawberry Blueberry Jam, Baklava, Cinnamon Almonds and Chocolate Covered Cherries, Ghirardelli® Squares® Chocolates and more, make this gift all the more decadent and irresistibly delicious. It’s a timeless expression of friendship and good taste. They’re certain to appreciate it – and you!